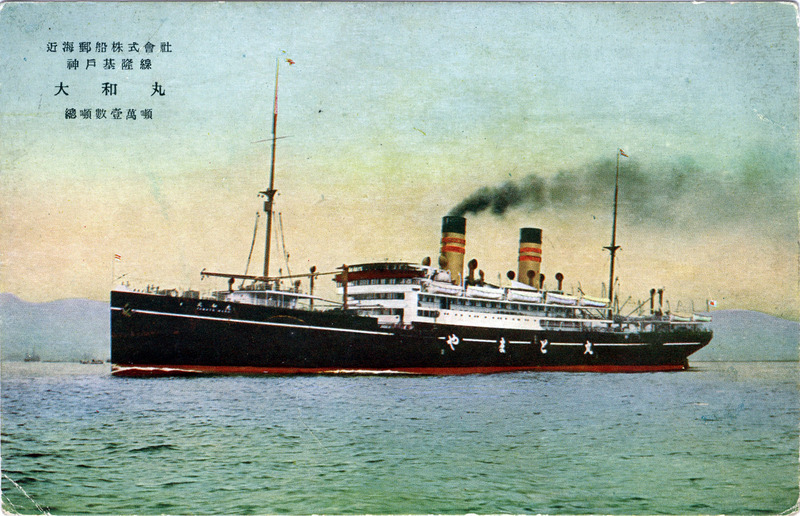 Yamato-maru, c. 1930, bearing the gold-and-red-stripe livery of Kinkai Yusen K.K. (KYK). Several ships have carried the same name. From the wiki: “In 1915, the Italian-built 9000-gross ton passenger-cargo ship Giuseppe Verdi was completed for the Transatlantica Italiana (TI) Societa Anonima Di Navigazione, Genoa, and transported thousands of Italian immigrants to Ellis Island, NY. In 1928, Giuseppe Verdi was purchased by Kinkai Yusen K. K. (KYK) of Tokyo and renamed Yamato Maru. In 1939, the Nippon Yusen Kaisha (NYK) Line of Tokyo acquired the assets of KYK, among them the Yamato Maru.